-40x30 or 20 grid. 5 10 x10 boxes. -2 players inside centre grid then others even around the others. -2 balls start in centre grid with 1 and 4. -Pass and move in number order. -Short pass then long pass. -Long pass must be lifted in the air. -Spare players move into box when vacated. -Strike bottom of the ball, slightly lean back, eye on target where passing. -Same grid size split into 3 zones. -Make middle zone larger than end ones. -Players split into 3 even groups. -2 groups on end and one in middle. -Ball starts in one end. -Red team start with the ball. -2 yellow players enter red zone. -1 blue can enter yellow zone. -Red team must attempt to make an angle to get ball to blue zone. 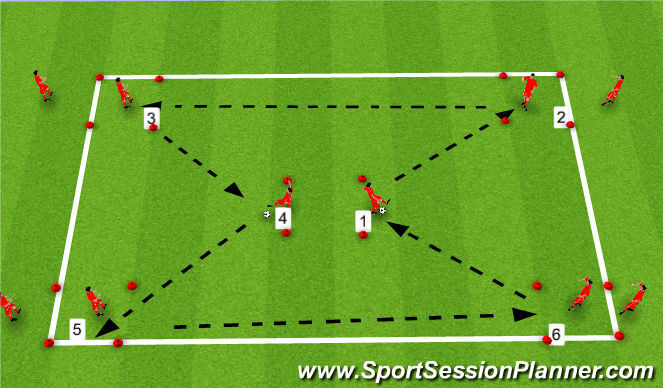 -Can use the blue player in the middle to pass to and to use as a dummy runner. -If succesful then Blue perform same exercise with reds reverse roles. -If yellow win the ball then they swap with team who lost possession. -Identifying the time of when the switch pass is available. -50x30 grid with 2 end scoring zones. -Split players into teams of 3. -2 teams inside and one on outside and in scoring zones. -Teams play v each other inside the grid and can use the wide common players. -They must get the ball to the common players inside the end scoring zones. If succesful the possession continues with that side. -Play 5 minute phases and switch teams. 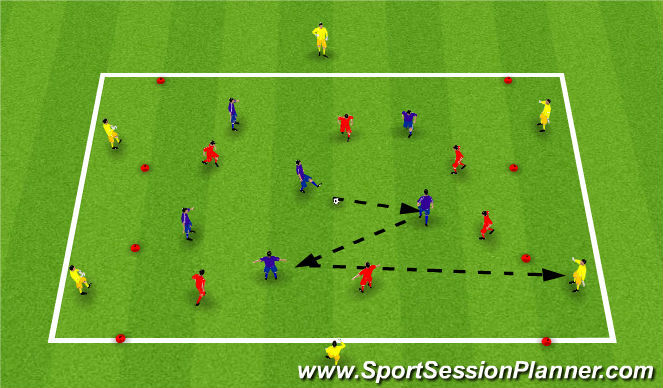 -Decision making on what type of pass is required to get ball into the scoring areas. -50x30 grid with one goal and 4 corner scoring zones. -Players retained in 3 even groups. -Designate a team that scores in the goal and the other team to score in scoring zones. -Both teams can use common players on outside of the grid. -Play 5 minute periods and switch teams. 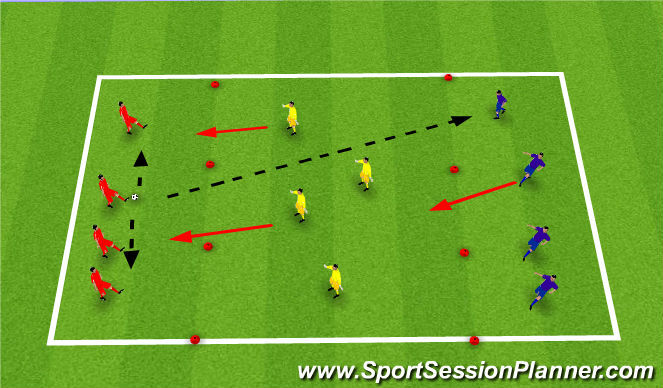 -Fast reactions to any turnover of possession. 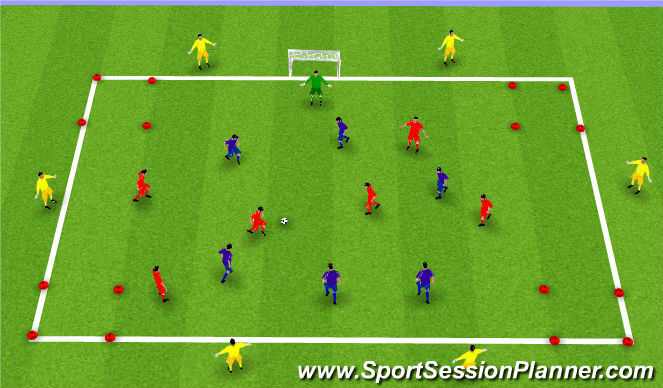 -How quickly ball can be transferred into scoring positions. -Switch of play key point.